I got some progress here! My System is now at 10.13.4 with security update working almost flawlessly except for one tiny detail. I got It running by running the script in phases. without anything plugged in, as recommended in the original post, ran the script passing "--unlockNvidia --nvidiaEGPUsupport --unlockThunderboltV12"
after script rebooted, I shutdown the MBP, plugged in the EGPU and eM, and started It again. BAM! Works flawlessly. OpenGL, Metal acceleration OK, tested in Heroes of the Storm, World of Warcraft and Rise of the Tomb Raider. The "Disconnect Nvidia GEForce GTX 970" Icon works like a charm. Hot Pluggin in, gives me Black screen on External monitor, but a Reboot solves the issue. Maybe there's some detail in the default behaviour of the script for this setup that is missing or in the wrong order? I dont know... I hope this information helps you to enhance It. The only thing that is not working is that the Audio port in my Lenovo Y27F Monitor is not beign detected in MACOS, only Windows. This is quite big news. Interesting that an older driver works so much better. "The Disconnect Nvidia GEForce GTX 970" Icon works like a charm? So you are the second. My Mid 2015 behaves the same way and I am also using an older driver (387.10.10.30.103), not that old as you. How about hot-unplug? Hot unplug gives Kernel Panic. No luck there. But I think It's way too much to expect from using such an old driver (It's a 378 driver!). I'm not sure which of .104 or .106 have a better performance on 10.13.3. I will try 106 now. Cause my first try I went right back to .104. @leoleal You are the champ ... I followed your steps, and I can confirm now that my external monitor is working as well now! When I do hot-plug it as usual the black screen, but log-out login and it work ... Also I can confirm that the disconnect icon work well ... It will close the application and deactivate eM ... no kernel-panic ... however when I unplug the cable after disconnect I will get kernel panic. Hot unplug gives Kernel Panic. No luck there. But I think It's way too much to expect from using such an old driver (It's a 378 driver!). 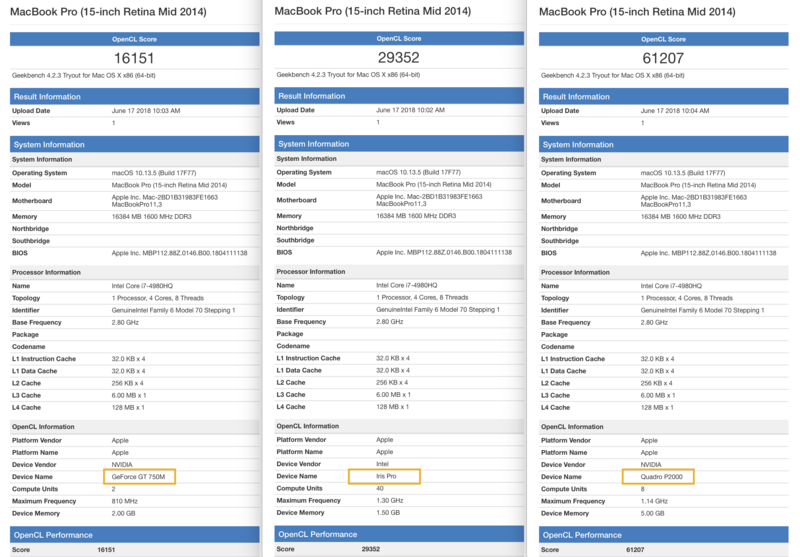 The .104 or .106 have a better performance on 10.13.3. I will try them now. Cause my first try I went right back to .103. This is very expected. Apple's documentation says that drivers need to be updated in order to handle surprise removal. We will try to find a workaround. And thank you for the solution. If you need testing, hook me up! I have a couple of states of the OS backed up in Time machine. I'd just like to second that @LeoLeal steps at least got OpenGL back working for me. Not sure whether it was doing it in a 2-step sequence, or just using the old nVidia driver. But I followed his steps, uninstalling the script, then installing the 10.25.104 driver, then rebooting and installing the rest of the eGPU enabler stuff, and I am back running in 10.3.4 again. 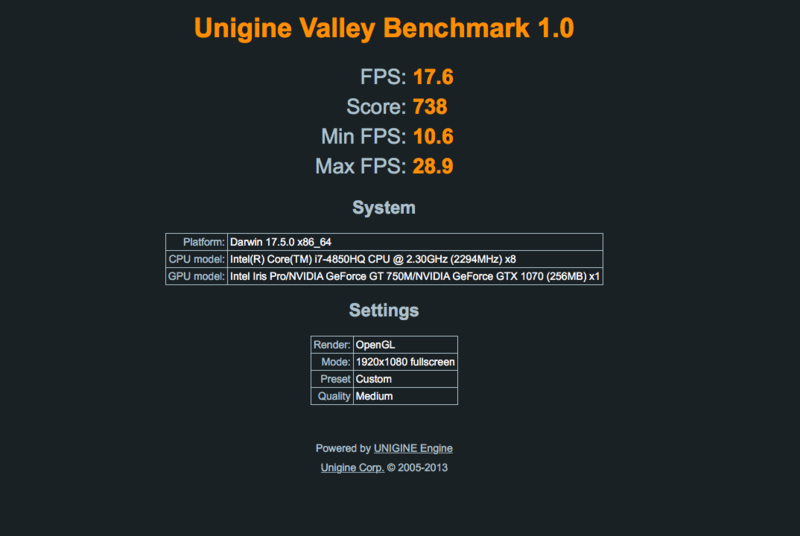 The Heaven benchmark works again on the eGPU. However, disconnecting still causes a kernel panic (it looks like it's going to work, but then it panics. I wonder if it's because of dropbox, as I get a screen saying that is preventing the disconnect, but then it panics before I can force close it). Hot plugging and logging out/in doesn't work. Deus Ex Mankind Divided still doesn't work - but it never has under any iteration of drivers or enablers in 10.3.x unfortunately. I don't still have Hitman installed to test, and don't have Tomb Raider yet, but will check that at some point. The other problems that still exist are those that have existed since 10.3.x - no brightness controls, the dGPU is always active instead of the iGPU (which impacts battery life), etc. I haven't tested the internal screen waking from sleep yet, but I imagine that will still be a problem. Rise of the Tomb Raider has subpar performance. I believe that is because It's made FOR 10.13.4, so I tend to believe also that the game uses Metal 2 API, and Nvidia driver 378 does not have Metal 2 Implementation. Maybe we have to wait NVidia to release a version that works with EGPU properly. @fr34k, @goalque. Came back to report my tests. Anyway, 378...104 driver is new enough to give excellent performance, just wont have full Metal 2 support. I don't know Pascal cards will behave with the drivers I tested. That needs some testing too... but I dont have a Pascal Card. Hi @LeoLeal, I have the same Macbook Pro Late 2013 as yours. Have you any luck with your egpu working on windows 10? I have a Aorus 1080 gaming box but couldn't get it working on windows. @LeoLeal any chance guide me on the steps you took to get it working on windows 10? I've tried using DDU to remove the Geforce 750M, and refind to spoof a osx boot to get the igpu, then hot plugging the egpu during the window boot. but no luck on getting windows to detect my egpu. any help would really be appreciated!! thank you! I didnt use refind nor anything like that. Just executed the step I described in my post. Dont disable dGPU. It will be useful for Windows as you can go to GEForce configuration and Dedicate dGPU to do Physx, while your eGPU will dedicate to rendering. Thank you so much for your discover I can tell that right know my eGPU is OpenCL/GL working again, so the problem with the dGPU´s look like are related to drivers. In my case I used another method, webdriver.sh to change the default driver which is installed by fr34k script with 378.10.10.10.25.106 driver version. First tried with fr34k script command (bash <(curl -s https://raw.githubusercontent.com/learex/macOS-eGPU/master/macOS-eGPU.sh) --install --nvidiaDriver 387.10.10.10.25.106) which in my case is not working showing the error you can see in the next picture. - Disconnecting eGPU from system bar works fine, switch off the external display and move apps to internet screen, but if switch off the eGPU, close session or reboot system takes to kernel panic. @charly4, that's because it starts with 378, not 387. That's why it didn't find a match. Hi there. I have a Macbook Pro 15'' TB2 Nvidia GeForce GT750M and an Aorus Gaming Box 1070. My OSx is High Sierra 10.13.4. I managed to install my eGPU using this script. I really have no idea what should I do. I really think it may be the fact that I hotplug the eGPU after I turn on the machine, but I'm not sure how else should I do. Also I tried to disconnect the monitor from the Aorus Box and only connect it a bit time later, but still the same. Thanks @LeoLeal! I followed your instruction and everything seems to be working(and very stable!). Heaven benchmark should be ~60 withVSync on 1080Ti, and as I remember it went up to 100 with VSync off. Want to ask what FPS do you have it Rise of the Thomb Rider? Because it is basically no matter what settings(ultra low or ultra high) I set I get 12-20 FPS in the scene on the very beginning where you look at the frescoes in the cave. If I set extremely low resolution, like 1024x768(or slightly more) fps goes up to 30. Previously I tried this game on Sierra setup and it was 60 at ultra highs, with ugly artefacts though, so I couldn't playing. Now picture is clear. I use Mantiz Venus + non Retina Macbook Pro 15, mid2012 + Aorus 1080Ti. Are you sure you're talking about RISE of the Tomb Raider? Cause the game was released to MacOS like... less than a month ago, and It's exclusively for 10.13.4. You cant run It on 10.13.3. It has no comparison to Windows. Windows gives me 40-80 FPS on High Settings. On mac, It's just tedious(I believe because of Metal 2 Implementation). Shadow and Ambient Occlusion have high impact on Mac Performance. How is this with Fortnite? i am having issues with the computer going to sleep and not waking up (ie i need to restart to get it to work). this happens regardless of whether the egpu is plugged in or not. I understand that many people are facing this issue - is it consistent with all dgpu egpu set ups? is there any solution for the time being? i find it a bit annoying to have to restart my computer every time the screen goes off if i have left it unattended for a few mins. Yep, I am sure. I don't remember exactly though which macOS I was using when was running it - 10.12 or 10.13.3, but it is possible to run Rise of the Tomb Rider on earlier macOS by changing minimum OS version in Info.plist. I am thinking now that glitches I mentioned before are probably because of incompatible software(didn't know it was released for Mac just recently). My problem is that I can't run eGPU on Windows 🙂 It simply hangs when booting if eGPU is plugged in, and plugging it in later doesn't help at all. Guess I have to upgrade my Macbook. as far as I know, it is a known issue. What worked for me was to plug in an external screen using the Thunderbolt port. have you guys tried changing the driver from nvidia web driver to default mac os graphics driver? i thought that might resolve the issue of no brightness control and black screen on sleep and then i could switch to the nvidia when i want to use the egpu - but doing that causes my mac to stop booting. gets stuck at the apple logo progress bar and i have to basically restore my system. is this also a known issue? Yes - this won't work. If you do this the system won't boot. I've done it before, and I boot into recovery mode, and use the terminal to remove the NVDAEGPUSupport.kext kext and all is back to normal after that (easier than restoring the system). After moving it back, you may require repairing permissions. See here.